George Alfred Excell was born in Oswestry in Shropshire in 1919. He was the son of Alfred George Excell and his wife, Edith Gladys. 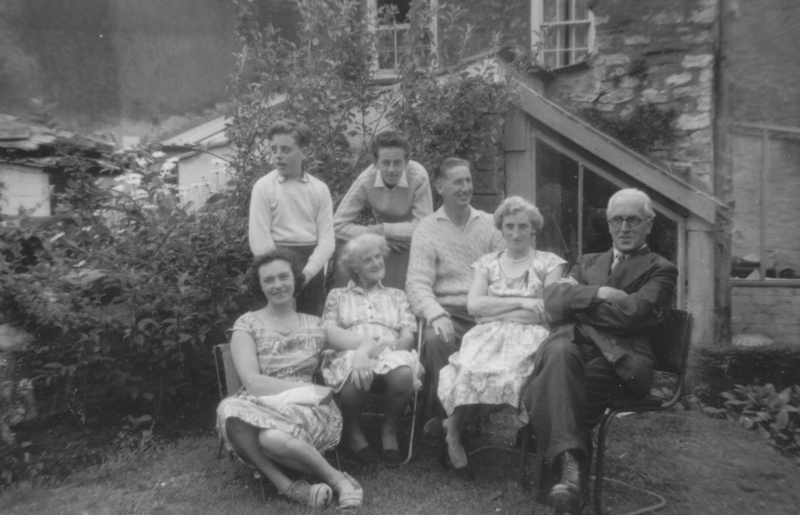 Within a few weeks of his birth, his family moved to Teignmouth in Devon and then moved again to Thornbury in 1923. They lived in a house on The Plain, between Savery’s and Bert Iles, the hairdressers (which later became known as 14 The Plain). His father ran a small boot and shoe business there until he bought larger premises on the corner of the High Street and Soapers Lane. Here he had as many as 18 or 20 people, mostly on a part time basis, specialising in making and repairing hob-nailed boots for the County Council, local quarries and farmers. He carried on this business until 1954. George was encouraged by his father to join the shoe trade, but he didn’t like it. He had a very early interest in electricity and was grateful to be offered an apprenticeship at the Thornbury and District Electricity Supply Company run by the Grace family. At first electricity in Thornbury was produced by a gas engine at the sawmill run by Edmund Cullimore. Francis Grace was married to Helen, Edmund Cullimore’s daughter. Francis started the electricity company to sell off the electricity they had to spare, but as demand grew he had to buy in electricity from the West Gloucestershire Power Company to supply all the businesses and houses. Along with Bert Pridham, Jim Knapp and Henry Court, George’s job was to wire up the houses, shops and businesses and put in the supply poles and connecting cables. George also helped out Francis Grace in the Picture House. After a full day wiring houses till five o’clock, he dashed home, had a quick cup of tea, washed and had to be at the cinema at five thirty. He worked there until ten thirty from Monday to Saturday and had a matinee on Saturday afternoons. George eagerly recalled the advent of ‘the talkies’ and the early days of colour films. When asked about his favourite film stars he replied with a chuckle “Oh, Shirley Temple and Donald Duck”. George was also very interested in music. At the Grammar School he had been a member of the school orchestra and after leaving school he formed a small band and went to local events including some in the Cossham Hall. Later, as a drummer, he played with many of the famous dance bands of the time, including Billy Merry and Joe Loss. For a time he became a redcoat with Billy Butlin at Pwllheli Holiday Camp. Here he recalls working almost 24 hours a day. As camp announcer he had to get up at 7am and be in front of the mike saying ‘Good morning Happy Campers‘ and reading out the menu and entertainment programme for the day. His duties with the dance band often carried on till 2 o’clock the following morning. Click on the thumbnail on the left above to see George as drummer in the Jack Webber Band. He was also an active member of Thornbury Dramatic Society. He joined in 1932 when the society was formed and was a ‘lamp boy’ for many of the early years. He continued his involvement with the Society until 1965. He only appeared in two productions, he was mainly involved back stage looking after the lighting and other special effects. George continued with this work with Francis Grace until 1939 when he joined up with the Royal Electrical and Mechanical Engineers (REME) despite being in a reserved occupation. We understand that he took his drum kit with him and often played in a military band. He was invalided out in 1942. He then started his own electrical business in the old shop at 14 The Plain which his father had used when they first came to Thornbury. In June quarter 1943 George married Joan B. Appleby in Bristol. They had met in an air-raid. Their first home was in the flat above the shop at 14 The Plain. In March 1947, George and Joan bought at auction the house at 18 Gloucester Road and they moved in shortly after. Unfortunately George had to give up his own business for health reasons associated with his army service. He sold this business to Cranbrook Radio with whom he worked for a few more years. There followed a number of jobs, with the Ministry of Supply, Cryselco, a manufacturer of fluorescent tubes, and then Bristol Aeroplane Company where he worked on the test beds for the Brabazon aircraft, the Britannia and was there during the very early stages of the development of RB211 engines for the Concorde. “was surprised when one night when I got home there were twelve egg boxes in the hall full of books and papers and goodness knows what and a little note to say that the safe would follow in a few days”. George continued in this role of clerk on a part time basis until 1965 when he was offered the job full time. He had been very busy with parish affairs and bored with his work at Rolls Royce. He was thus heavily involved with the development of Thornbury and the change from a parish council to Town Council in 1974. George carried on as Town Clerk until 1984 when he retired. In his later life he was asked if he would have wished to be the Town Mayor, George made it clear he preferred the behind the scenes role to whatever he was involved in. He saw his role as Town Clerk as a supportive one – he said ‘The drummer always sits behind the band”. George did a great deal of work on the house. It was he who put in the downstairs bathroom as it presumably had no bathroom until that time. He also knocked down the old outhouse to put in the lean to conservatory. He used the rubble from the old building to make the foundation of the famous workshop at the bottom of the garden and at some time built the flat-topped wall between 18 and 20 Gloucester Road. George did most of this work himself with the help of a couple of tradesman. In the first couple of years after moving in they had at least one very wet winter and George arranged for the pump to come up from the cemetery to pump the cellar out. The water was half way up the cellar steps. Joan thought the job was easier because George had had a cement floor put in to the cellar. The coal used to be delivered through the chute into the cellar. George and Joan continued living at number 18 until June 1970 when they moved to a larger and more modern house in Severn Drive. He continued his involvement with Thornbury life. 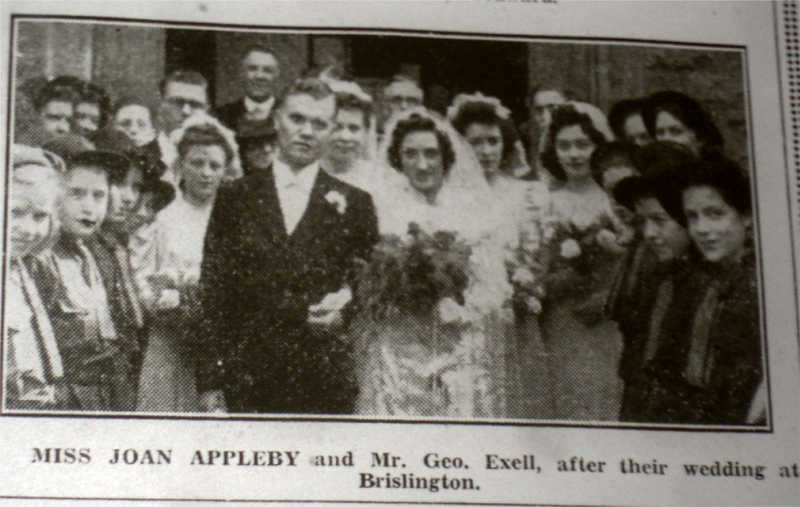 In 1972 when the Armstrong Hall was opened one of the meeting rooms there was named “The Excell Room” in recognition of George’s contribution to the town. In 1984 George became the Distribution Manager of Thornbury Magazine and he carried on this role for 15 years. George died in September 2005 and he is buried in Thornbury Cemetery. Joan died in Thornbury in December 2011.